After months of screening some 90 jurisdictions and countries in light of EC criteria of lack of transparency and harmful tax measures such as 0 or near 0 corporate tax rates, EU Finance Ministers have agreed a tiny list of 17 countries: American Samoa, Bahrain, Barbados, Grenada, Guam, South Korea, Macau, Marshall Islands, Mongolia, Namibia, Palau, Panama, Saint Lucia, Samoa, Trinidad and Tobago, Tunisia and United Arab Emirates are the countries listed, officials said. The second list includes countries like EU candidates Turkey, Serbia and Montenegro, as well as Switzerland, Bosnia and Herzegovina, Macedonia, Morocco, Thailand, Vietnam and Hong Kong. It also includes entities that are considered as being among the main tax havens but which have promised to change their legislation: Bermuda, the Cayman Islands as well as UK-associated Jersey, Guernsey and the Isle of Man. Eight countries and territories recently hit by hurricanes - Antigua and Barbuda, Anguilla, Bahamas, British Virgin Islands, Dominica, St Kitts and Nevis, Turks and Caicos, US Virgin Islands - were given a grace period until February to come up with commitments. The list excludes the most active harmful tax countries or jurisdictions including Benelux, Ireland, Malta, Cyprus, Switzerland, British channel islands, US Delaware, Singapore or Hong-Kong. Even Bermuda, that hosts the Paradise’s offshore services firm Appleby, did not make it to the list. 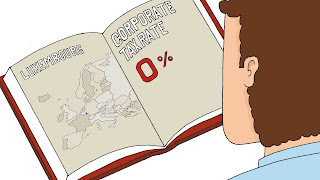 Jan Willem Goudriaan, General Secretary of EPSU, said “This tax havens list is a big sham. EU Finance Ministers have failed to agree a coherent and transparent blacklist with deterring sanctions to make it effective. Coupled with the cuts in corporate taxes in many EU countries, today’s decision means that tax competition in and outside Europe will continue to run the show at the expense of workers’ wages and quality public services. On the international scene, as tax rules for the digital economy are being discussed, this list is a sign that the EU is losing its credibility on fair tax.